The Giving Voice team has been on the road for just over two weeks now, they have ten shows under their belt, but they are nowhere near done yet! In fact, they are only a third of the way through, there are still many more schools and youth to empower and inspire all around Manitoba. The team’s been rocking their shows and the reception has been amazing! The first stop on the Giving Voice tour was at Miles Mac here in Winnipeg. The occasion was all the more special since this school was the alma mater of stage manager Sydney Hayduk. The students loved it, particularly some self-identified youth in care who found it a huge relief to have their friends hear about what life can be like in the system. 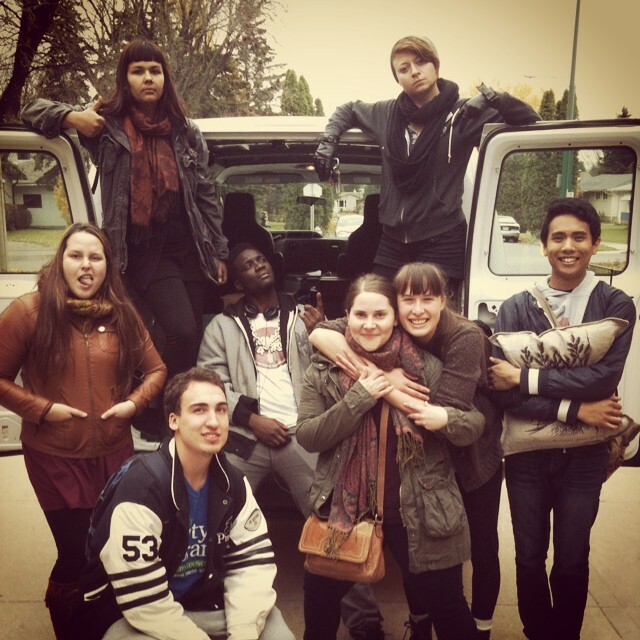 Next, the team had to wake up bright eyed and bushy tailed for a 6:30am departure time to make it to Brandon’s Vincent Massey High School for an 11am show. Well, at least the gals were awake, the boys slept through the whole drive! In the end it was worth the early morning for the extremely energetic reception the team received. So far VMHS holds the record for quickest student interventions, they were keen to stop the action and solve the problems! After a restful weekend the team hit the road again to go to Lac du Bonnet, which had over 200 students packed into their gym to see the show! “Excellent, excellent show! Student and staff response has been amazing.” was the note we received from teacher Penny Osis. Afterwards the cast posed for pictures and were interviewed by the Lac du Bonnet Clipper! St. Aidan’s Christian School was a smaller venue but the first one where the teachers also jumped in to take part. Murdoch MacKay’s students had a lively discussion about what happens when the bully becomes the victim. October 24th was a special performance as the team performed at Drama SAGE day to an audience full of teachers. The teachers loved it although they weren’t as quick to jump in as their students have been! Several argued that the play isn’t just for high schoolers, but important to educate adults and to encourage more foster parenting. Thankfully we have an opportunity for people of all ages to catch the show for free in the Carol Shields Auditorium at the Millennium Library on Sunday November 2nd at 2:30pm. Psst, reservations are almost full, phone or email us while you still can to reserve! Click here for info. The team on the road! Wednesday they got to stay home in Winnipeg while they put on the show for over 350 students in Tech Voc’s huge theatre! Today, they are heading out to Steinbach Regional Secondary before getting Halloween off to rest…or go trick or treating, or dancing, or whatever they would like to do with their well-deserved break! Hopefully they don’t get too comfy though, next week they have to be in tip top shape for seven shows in a row Sunday through Friday! Keep breaking legs Giving Voice team! Laughter, food, drinks and supporting great theatre! Sometimes we all need a break from dreary fall days, and what better way to stave off the onslaught of winter doldrums than through laughter? And not only that, but what if you can laugh, and support the transformative theatre work of Sarasvàti Productions at the same time for only $12? If this sounds like a pretty sweet deal to you, then buy a ticket (or 2) and join us at our Rumor’s Comedy Fundraiser on November 18th! Last year was the first time we did a Comedy Fundraiser, and it was a blast! Our wonderful board members, staff and supporters packed the place. Most came early to get in a hearty dinner and drink before the comedians took to the stage. Ron Josol, the comedian of the night, didn’t disappoint as he kept everyone laughing. Last year’s sold out show! And the featured comedian this year is sure to give us just as good a time, if not better! Reese Waters has a ton of experience under his belt having performed on The Late Late Show with Craig Ferguson and The Late Show with David Letterman. If you want to check out his performance on The Late Show watch this video! Not only will you get to see Waters in action, but you will get a chance to see the brand new Rumor’s. They’ve been closed for renovations and are opening their doors again November 1st, which comes just in time for Rumor’s 30th Birthday making them the longest running comedy club in Canada. If laughing and experiencing a newly renovated Winnipeg icon aren’t enough, your purchase of a ticket through us will help us continue to bring you transformative theatre. Theatre that includes: developing relevant school tours like Giving Voice, offering support and workshops to emerging artists, and producing the world premiere of Governor General Award winning playwright Catherine Banks’ new play Miss N Me! If you want to come out on November 18th to support us phone our office at 204-586-2236 before November 10th to purchase tickets! If you can’t make it out on November 18th, but still want to support us and enter for a chance to win passes to some awesome local festivals, you can purchase raffle tickets for Winnipeg’s Great Festival Raffle from us! For more info on both of these opportunities, click here! And they’re off! The Giving Voice team officially began their seven week long school and community tour yesterday. We are thrilled to finally be sharing this production with over 3,000 youth around Manitoba and giving all of them a chance to share their voice in the discussion around youth in care, whether they have firsthand experience or are learning about it for the first time. On Thursday the team received an enthusiastic response to the preview at Graffiti Gallery hosted by our partner VOICES: Manitoba’s Youth in Care Network. It was great for the cast to be able to present the work in front of an audience, especially to finally be able to practice the intervention scenes! We had a lot of brave people step forward to try out some positive solutions to the situations presented. At one point we even had two audience members onstage at once playing characters in a scene! Marie presenting Amanda with a gift for all her hard work! After the successful performance came some laughter, hugs and tears as Marie, Program Coordinator at VOICES, made a speech honouring the contributions of three wonderful women to the creation of Giving Voice: Amanda Gauthier, the mentor of the 2012-2013 Voices Leadership Team, who turned their idea for a play by and about youth in care into reality; our very own Hope McIntyre for leading this project from start to finish; and Alexis Martin for being the lead consultant on this project and lending so much of her story to the production. 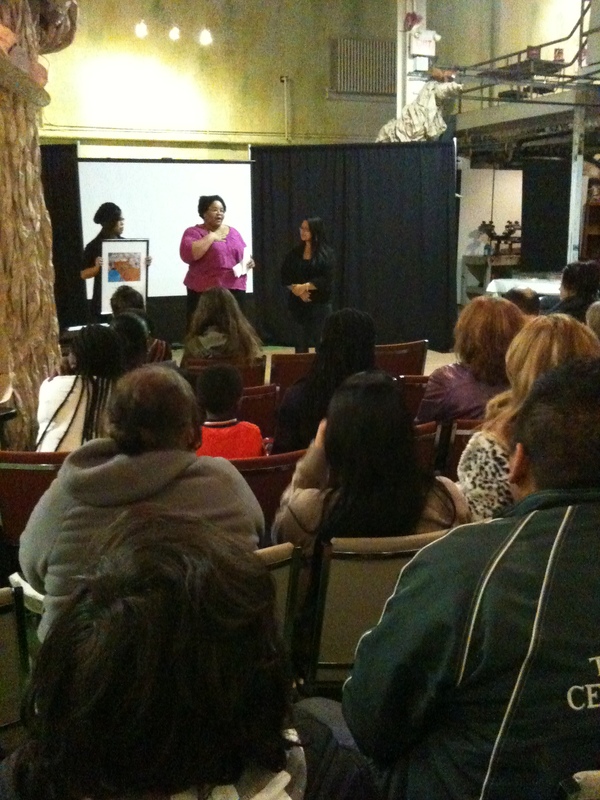 Afterwards, everyone had a great time eating some tasty snacks and talking about the show with the Giving Voice team. But the team couldn’t talk long since they had to practice taking down and packing up the set, when they’re in schools they’ll only have 30 minutes to load out so that the students can have their gyms and theatres back! Yesterday morning the tour started at Miles MacDonell and our first high school audience was very responsive! It helped that it is the alma mater of our very own stage manager, Sydney Hayduk. 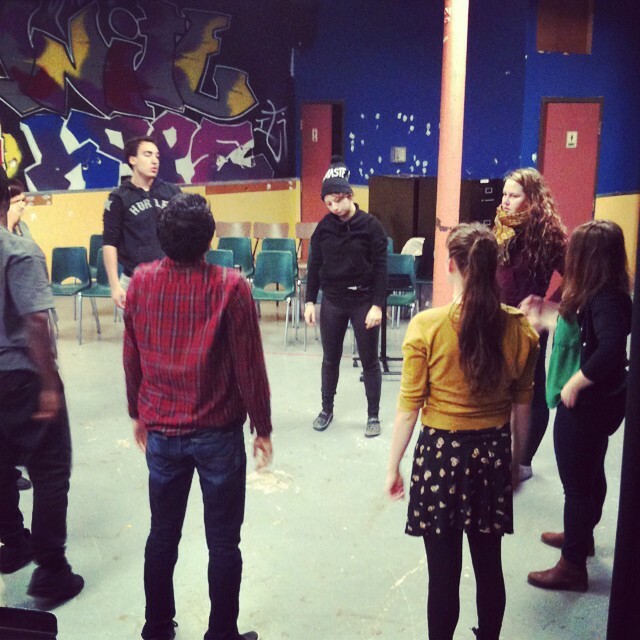 Photos from last year’s IWW Cabaret of Monologues: Rise Up! While we were all having fun with FemFest, the Giving Voice cast has been hard at work rehearsing for our October 13 to November 28 school tour. They will be traveling around Winnipeg and rural Manitoba with this timely and important forum theatre piece. Since we began developing the piece, there is been a big demand to see the final product. For youth who won’t catch it at their schools and for adults interested in this powerful play, there are two chances for the public to come and see it! With all the attention CFS has been getting in the news recently, Giving Voice stands out by providing a voice to youth who are actually in the care system and the challenges they face every day, particularly the stigma being in care carries and the bullying that can result. Manitoba has the highest rate of youth in care in Canada, which makes this play all the more relevant to all Manitobans. We hope this play will spark conversations about the state of Manitoba’s foster care system and will contribute to positive change within our community. If you’d like to be part of the conversation, the first opportunity to see this play written by and about youth in care is at our community preview on October 9th at 7:30pm in the Graffiti Gallery. This performance is being hosted by VOICES: Manitoba’s Youth In Care Network, the program who’s youth initiated this entire production. Two years ago after seeing our productions of Empty and Diss they looked for a way to get their stories on stage. Marie Christian, the Program Coordinator at VOICES, reached out to us and we’ve been collaborating on this project ever since. Admission to this performance is by $5 donation with all proceeds going to support the VOICES’ scholarship program. Our second community performance comes halfway through the school tour on November 2nd at 2:30pm in the Carol Shields Auditorium in the Millennium Library as a part of the Winnipeg Public Library’s teen program. As much as we’d like to, it’s not possible for us to make it to every school, and this is a great opportunity for youth groups to come experience and be empowered by Giving Voice, and who knows, maybe they’ll be telling their own story onstage next year! If you’re curious for a sneak peek, check out the story CBC did on us here! For more information on Giving Voice you can visit our website or phone us at 204-586-2236. Please note, seating is limited for both performances, so get there early!